Happy Caturday! We are turning to Easter Week preparations. We wish everyone a peaceful and happy upcoming Easter week. This fun design is from Imikimi and the frame and lettering from PicMonkey. Good morning and Happy Easter week to both of you - and your mom. What a cute Easter Card. Your card is just darling! 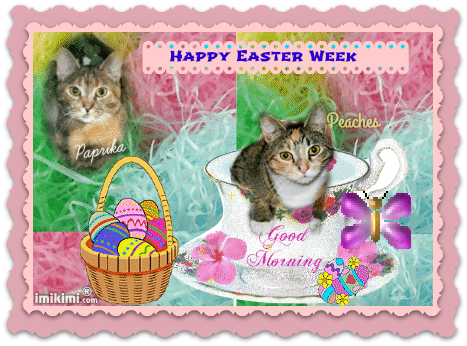 Love the Easter week pic! Love your card. I had to scramble to make some Easter art for this week.